Washington, DC—Each year, the U.S. Department of State must report to Congress on whether Mexico has sufficiently improved its human rights record in several key areas to warrant the release of select conditioned funds for the Mexican military. 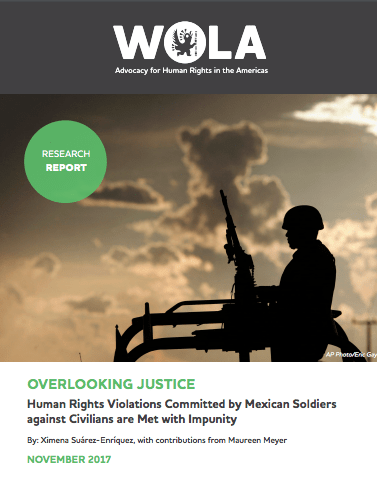 According to a new memo by the Washington Office on Latin America (WOLA) and seven other leading U.S., Mexican, and international human rights groups, the United States should not release this portion of aid to Mexico, given the government’s lack of progress in meeting the human rights requirements included in the security assistance package. According to the memo, in 2017 the Mexican government again failed to thoroughly and credibly investigate and prosecute emblematic cases of human rights violations. This includes the extrajudicial execution of more than a dozen civilians by the Mexican Army in Tlatlaya, Mexico State in June 2014, as well as the enforced disappearance of 43 students from Ayotzinapa, Guerrero in September 2014. In some cases, there is also strong evidence of Mexican authorities obstructing investigations into such abuses: in recent months, the UN Office of the High Commissioner for Human Rights (OHCHR), the Inter-American Commission on Human Rights (IACHR), and a Mexican federal tribunal highlighted grave irregularities in the Attorney General’s Office investigation into the Ayotzinapa case, including the use of torture to coerce confessions and the failure to investigate Federal Police and military officials that may have been involved in the students’ disappearance. While two new laws aimed at taking a tougher stance on torture and enforced disappearances passed in 2017, both laws have been met by government resistance, and their implementation has been slow and incomplete. The Mexican government has openly violated the General Law on Torture since its enactment, including by continuing to allow evidence obtained through torture to be admitted in criminal trials. Additionally, the full funding and implementation of the various search and investigation mechanisms established under the General Law on Disappearances has been severely delayed. Mexican authorities have also failed to properly consult with civil society and family members of the disappeared regarding the implementation of these mechanisms, as is required under the law.